[Thomas Sanladerer] wanted to create some molds using 3D printing for concrete and plaster. He used a delta printer with flexible filament and documented his process in the video below. If you’ve printed with flexible filaments before, you know you need an extruder that has a contained path. [Tom] borrowed a printer, but it didn’t have that kind of set up. The first step was to swap extruders with another printer. [Joerg Sprave], a.k.a. that German guy on YouTube that has fun with slingshots, built a spinning steak knife saw thing. Basically, it’s eight steak knives attached to a wheel and driven with an electric drill. It’s not a terribly complex build, but it does give off a zombie apocalypse/first person shooter melee weapon vibe. Why use potatoes when you can use D-cell batteries? [CasterTown] on YouTube put together a small propane-powered spud gun that can put a battery through a car door. This isn’t the first time we’ve seen batteries used as ammo, but it’s still an extremely powerful build. Oh man the 60s were cool. Back in the 60s, safety wasn’t a huge concern. Any 10-year-old could walk into a dime store and buy Jarts – a game consisting of kids throwing sharp spikes at each other. Also, magazines had descriptions of how to build a freaking mortar in a backyard. Able to make a 20-foot grouping at 1900 feet, this would probably merit a visit from a SWAT team today. Needless to say, don’t try this at home. Last but not least is [Rocketlab] and [SadisticTheory]’s $15 flamethrower. It’s just a gas tank from a 2-stroke engine, a 12 volt battery and a pump. Common sense requires us to mention this build is very, very illegal (apparently it is legal)and extremely unsafe. Don’t replicate this build. Actually, we take that back. You shouldn’t build any of these weapons because they’re very dangerous. Just think of these as a neat thing to look at. Let other people hurt themselves. You may complain about how unsafe these weapons are in the comments. [Mark] and his friends love fireworks, but got tired of the traditional ground-launched mortar rounds, so they decided to spice things up a bit. A while back he purchased an Army-issue bazooka at a gun show but didn’t use it for much, so it sat unused for about 10 years. He dug it out of storage, then hit up his local hardware store for a few lengths of PVC piping. He cut the pipes to size and then used his 3D printer to build a couple of parts to securely mount the PVC pipe into the bazooka’s shell. With his standard tube, he can shoot 2” mortars from the bazooka, but says he can add a second nested length of PVC to allow for smaller rounds. Obviously this sort of setup can be quite dangerous if it is mistaken for actual weaponry, or if your fireworks were purchased from some guy’s trunk at a highway rest stop. [Mark] and his friends have taken some precautions when they use the launcher, but this is still clearly a risky enterprise. 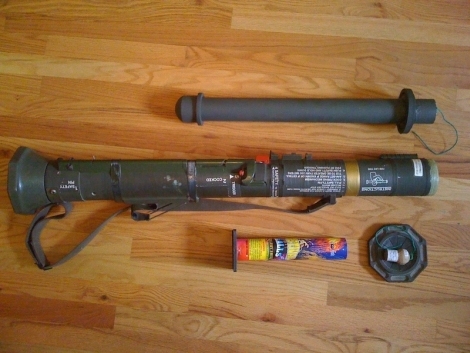 That said, we think its awesome, and if anyone has a spare bazooka sitting around, feel free to send it our way! Continue reading to see the bazooka fireworks launcher in action. Not a bazooka, it’s an AT-4. Thanks to those who pointed it out.